✔️ A NEW, NATURAL, CAFFEINE-FREE BOOST, DESIGNED ESPECIALLY FOR GAMERS. 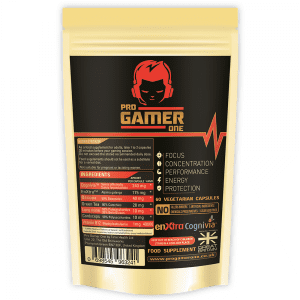 Time Health’s Pro Gamer One combines 7 proven natural ingredients including Cognivia, EnXtra, Bacopa, Green Tea, Lion’s Mane, Cordyceps and Vitamin B12 in a stomach acid resistant capsule so you absorb 100% of the nutrients. Taken together, these ingredients provide a powerful mental edge. Cognivia™ is a unique mixture of two types of Sage, specially developed to improve cognitive output. EnXtra™ is natural, caffeine-free and clinically proven to improve alertness and focus for up to 5 hours. Caffine-Free Green Tea extract is rich in antioxidants and has a calming effect which aids focus and concentration. Lion’s Mane; a mushroom superfood for the brain. A large body of research has focused around its brain-boosting and neuroprotective effects in the last few years, and the results are nothing short of astounding. Cordyceps; this mushroom is used by many professional athletes to support increased oxygen uptake and greater endurance. Vitamin B12; Supports brain function and boosts energy so you can play better for longer. ✔️ NO CRASH. 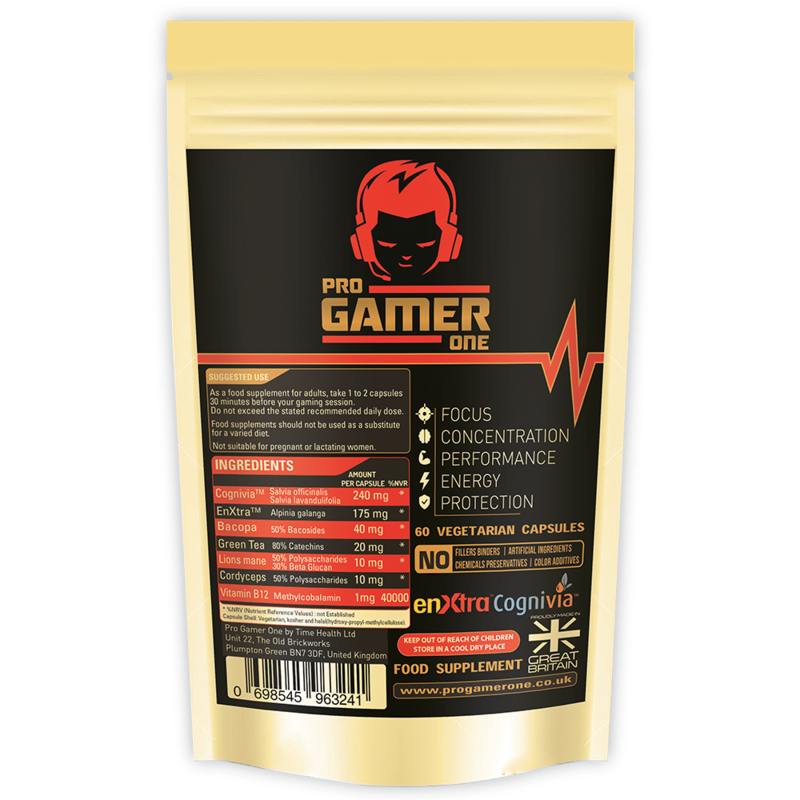 Time Health’s Pro Gamer One is ZERO SUGAR & CAFFEINE FREE unlike similar gaming performance enhancers, allowing you to play at your peak for longer. Cognivia Salvia ofcinalis/Salvia lavandulifolia 240mg – EnXtra Alpinia galanga 175mg – Bacopa 50% Bacosides 40mg – Green Tea 80% Catechins 20mg – Lions mane 50% Polysaccharides 30% Beta Glucan 10mg – Cordyceps 50% Polysaccharides 10mg – Vitamin B12 Methylcobalamin 1mg. 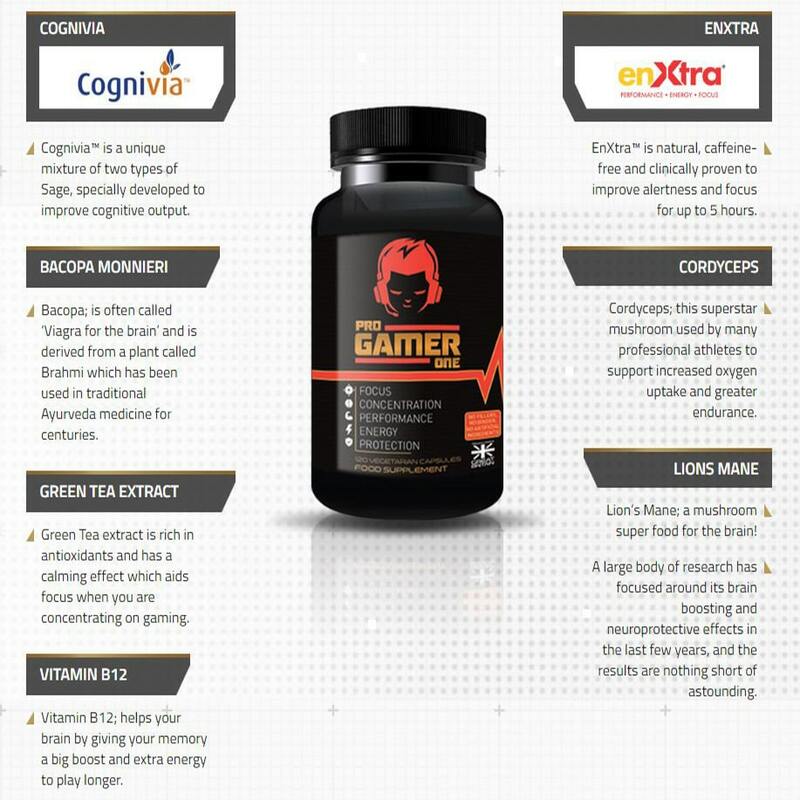 As a food supplement for adults, take 1-2 capsules 30 minutes before a gaming session, or as directed by a healthcare practitioner. Do not exceed the stated recommended daily dose. Although i've not bee taking these long I already feel like they're helping. I use them for both gaming and study since both involve staring at a screen and require focus and concentration. Definitely seems to be helping with keeping me calm whilst working on my assignments.